PLEASE CLICK HERE FOR MORE DETAILS ABOUT THIS BOOK AND OTHER GREAT GOOSE BOOKS! It happened on a calm and sunny April morning. 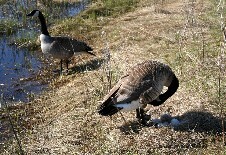 Thor, a gander whose goose was nesting, marched over to Greg and Mary's territory. 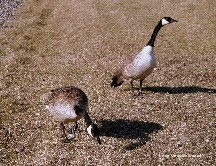 That's asking for trouble, in the world of Canada geese! Mary was on her nest, a perfect picture of motherhood, when Thor stormed up to Greg. Within seconds, Greg and Thor were hissing and snarling and growling and battling wing to wing. Mary honked in support of Greg but remained on her nest. The other geese stopped whatever they were doing to watch and honk. The vicious fight continued amid the deafening honks, hisses, snarls, growls, slaps and shouts (ours). Greg and Thor attempted to grab each other's necks with their beaks, slapping each other with their wings. The other geese were now circling the two fighters, honking even more loudly and excitedly, as if they were cheering for their favorite goose to win the fight. We joined the ruckus by yelling at them to stop fighting. There was no let up. They seemed to balance on their tails as they continued to bite each other's necks and strike each other with their powerful wings. They'd been battling for over five minutes. Finally, Greg gave up and fled! There's Thor chasing Greg into the pond. Think it's all over and peace has returned? After chasing Greg into the pond, Thor turned around and made a beeline for Mary, who was honking and looking for Greg. He rushed at her! Taken by surprise, Mary nearly fell off her nest! That's Mary giving Thor a hard time for his bad behavior! Thor, of course, rushed Mary into the pond. 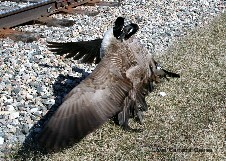 Two Canada geese are more powerful than one. Greg and Mary get together. They charge at Thor, driving him off their territory. Satisfied, they return to their nest. Greg resumes guard gander duty. 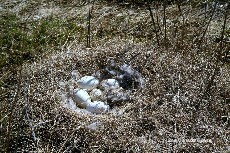 Mary plucks down from her breast to line her nest and soon resumes incubation. Peace reigns over the nesting site again.